25-03-2010 12:00 pm 24 March. Haitian writer Frankétienne was designated UNESCO Artist for Peace by the Director-General of UNESCO, Mrs Irina Bokova. 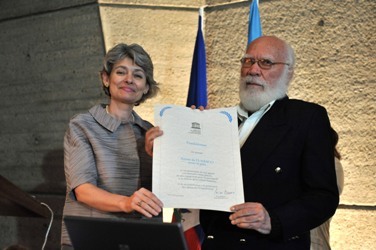 The ceremony took place during the Forum ‘Rebuilding the social, cultural and intellectual tissue of Haiti’, held on the same day at UNESCO Headquarters in Paris. Writer, comedian and painter, Frankétienne, who is also teacher, is an emblematic figure of Haitian culture. Author of fourty books in French and Creole, such as Dezafi (1975) and Ultravocal (1972), he has received numerous literary prizes and distinctions. His play ‘Melovivi ou le Piège’ was performed the same evening, after the end of the Forum. Designated for two years, Frankétienne will support, as UNESCO Artist for Peace, the Organization’s programmes that seek to promote books and linguistic diversity. UNESCO Artists for Peace are internationally-renowned personalities who use their influence, charisma and prestige to help promote UNESCO’s message and programmes. Musician Manu Dibango (Cameroun), fashion designer Bibi Russel (Bangladesh), musician Gilberto Gil (Brazil), actress and singer Maria de Medeiros (Portugal) and writer Scott Momaday (USA) are amongst this group of personalities.